Al’s accomplishments would fill a stadium, a museum and a gallery! Athlete, teacher, coach, writer, artist, sculpture, war hero and all-around great guy. His soccer career began at Central High School (1934-1938) as team captain. Then onto Temple University (1938-1940 and 1946), where he was captain and an All-American player. He played and starred in many leagues and clubs around the Philadelphia area. In 1953 he played soccer in the Maccabiah games in Israel. 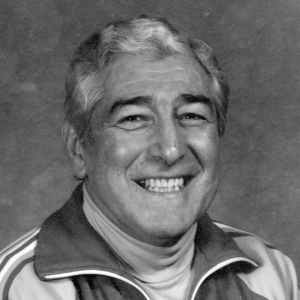 As a coach for Drexel University (1948-1991) his team won the Division I Championship, and in 1992 he was recognized for his forty years of soccer coaching and thirty years of cocahing tennis. His elected offices include President of the Philadelphia Soccer Coaches Association, and President of the Temple University Soccer Alumni. His many awards include Drexel Hall of Fame 1958, and a NSCAA Letter of Commendation for soccer and tennis. Fortunately, Al played soccer, therefore, saving his hands for further successes. Honing his artistic talents at The Philadelphia Museum of Art, Fleischer Art School and Tyler School of Fine Arts, he has exhibited at many shows using metal, wood, watercolor, charcoal and pastels.